When the College Football Playoff Committee announced its first list of teams belonging in the final four, it seemed that the Confederacy had won the Civil War and banned everything north (and west) of the Mason-Dixon Line. Fortunately, by the time the vote counted for anything more than a weekly dose of drama, the committee had come to its senses. Of the four teams in the Committee’s initial selection, not a single one emerged victorious in a post-season game. The good the bad, and a guideline for the future of the four-team playoff is the subject of this week’s Three-and-Out. The Good. The best part of the new system is that, in the end, the playoff was among four conference champions. Had the old BCS system been in place, the two first-round losers would have met for the championship — business as usual, with heavy prejudice favoring the lower right corner of the country. The replacement of the so-called “objective” computer ranking systems with human judgment was also a step in the right direction. The idea that a computer program can produce objective results based upon subjective input is an insult to our collective intelligence. The number of times the computer rankings proved the “garbage-in, garbage out” adage would justify a convey to the landfill. Three SEC teams made the initial final four and failed to win a single bowl game. With the computers out of the picture, the playoff results shined the light on a what has been brewing since at least 2010: The Southeast Conference is not the dominant conference that it once was. The SEC’s last dominating win in the BCS Championship Game against an impressive non-SEC foe was against Texas in 2009. Since that time, Auburn edged Oregon on a last-second field goal; Alabama beat SEC-West foe LSU in a rerun that proved nothing nationally, then followed it up the next year by beating a Notre Dame team that had barely survived against a half-dozen mediocre teams. Then in the finale of the two-team “playoff,” SEC champion Auburn lost to Florida State by a field goal. Related to the benefit that the four spots all went to conference champions is the fact that, thankfully, no conference got two teams in the final four. With only four spots available for five power conference champions, it makes no sense to exclude two champions to provide a second chance for a team that failed to win its conference. And while the Committee played with the idea of as many as three SEC teams in the final four, it didn’t go through with it when it counted. The Bad. By lowering undefeated Florida State to number four, the Committee recognized just how gimpy the Seminoles were in too many of their wins. Much like Notre Dame in the 2012 season, FSU regularly demonstrated that it was only a field goal or a single touchdown better than too many teams that simply weren’t that good. 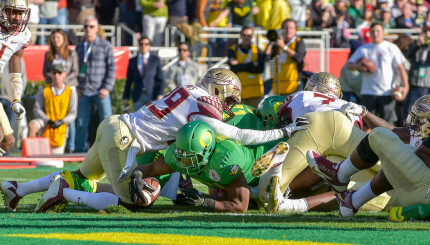 Florida State’s win streak came to a screeching halt in the Rose Bowl. Still, what was the Committee to do? Exclude the defending “National Champion,” which coincidentally was the only major undefeated team in the country? The “bad” here is that the prejudice of dipping into last year’s results still exists, as does the attitude that “a win is a win is a win.” An elite team will usually have a close call or two — maybe even a loss — against an inferior team, but as was the case for Notre Dame in 2012 and Florida State in 2014, when they went up against truly elite teams, they got creamed, Notre Dame by four touchdowns to Alabama and FSU by six touchdowns to Oregon. This brings us to the other “bad” result, which was the exclusion of the Big 12. At least one power conference had to be excluded, and it is certainly arguable that the Big 12 did it to itself. First, more than any conference in the country, its members scheduled patsies for their three nonconference games. The entire conference did not have a single impressive nonconference regular season win, unless you consider TCU’s 30-7 win over 8-5 Minnesota to be impressive. Then, there was the issue of no conference championship, compounded by the dual championship between Texas Christian and Baylor based upon regular season play. Right or wrong, undefeated Florida State was in. And while Oregon, Ohio State, and Alabama were knocking down impressive conference championships, Baylor took down Kansas State by eleven and TCU decimated hapless Iowa State. The die was cast. True, TCU dismantled initial final four candidate Ole Miss 42-3 in the Eat Mor Chikin Peach Bowl. With perfect hindsight, the Horned Frogs would have probably made a stronger showing than FSU in the final four, but it was too little, too late. Guideline for the future. The initial four-team playoff set the stage for what comes next. Having four conference champions involved proved highly successful. That the championship came down to two teams that would have been left out under the old system certainly discourages the notion that two (or more) SEC teams will be included at the expense of a power conference champion. 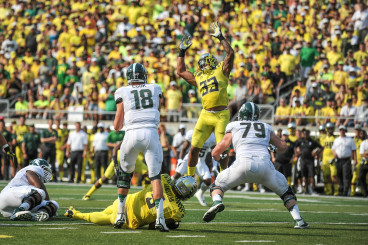 Michigan State — or any other B1G team that knocks off tOSU — would be a cinch for a playoff berth. So who gets left out next season? Certainly not the B1G. 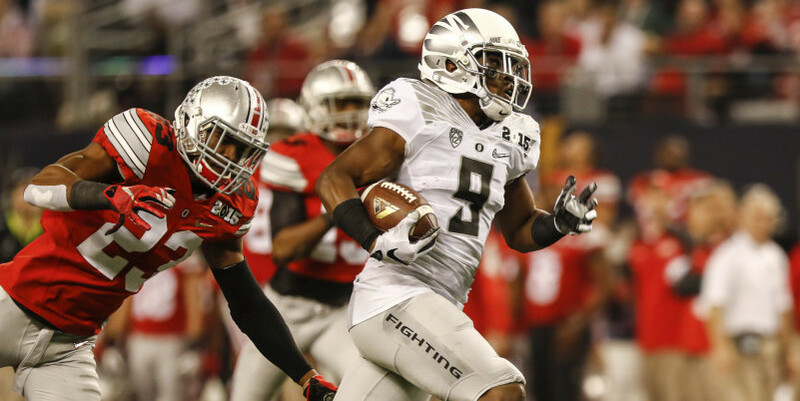 Ohio State is the returning champion and if any B1G team knocks the Buckeyes off, it is in. The Pac-12 represented itself well in both regular season nonconference and post-season play, and the Pac-12 South is now regarded as the deepest division in college ball. It would take a substantial collapse in nonconference games or total cannibalization to keep the Pac-12 out. It would seem a little politically incorrect to exclude the Big 12 two years in a row. However, Baylor’s 2015 nonconference schedule consists of Southern Methodist, Lamar and Rice. TCU’s is little better with S.F. Austin, Southern Methodist and Minnesota, so neither is exactly out to prove itself on the national stage. That, and the lack of a conference championship game, could again prove to be the conference’s undoing. The SEC did an impressive job of embarrassing itself in its bowl games, and the undefeated ACC champion (Florida State) lost its bowl game decisively, despite what its non-returning Heisman-winning quarterback had to say about the matter. If the Big-12 produces an undisputed champion, it will likely be included. A one-loss or worse ACC champion is likely first team out, and would certainly need to have a better record than a Big 12 or SEC champion. It would be so simple — and as fair as possible, given the present structure — if the Football Championship Selection Committee would simply name the one power conference champion to be excluded at the end of the year, state the reasons why, and then seed the remaining four champions. The Committee’s weekly charade that started off with teams that ended up 0-4 in bowl games and then gradually worked its way to the rational inclusion of what appeared to be the four strongest power conference champions was a colossal waste of energy. There’s enough drama on the field. For those who need more, there’s always the soaps and reality shows.